When we left Italy to return to North America for the winter last year, the one thing I knew I really was going to miss were the local street markets. These markets rotate from town to town each day of the week, and on average we would visit a market at least three times a week to buy all of our fresh seasonal produce. Once stateside though, I was thrilled to find out that a new farmer’s market had just begun to run every Saturday just a block away from our house. There are a number of different booths at this market selling everything from fresh plants, baked goods, olive oil and fresh seafood, but what excited me most was to see the booths selling fresh, seasonal organically grown produce. We now visit the market every Saturday and I usually cannot help myself and end up buying a couple of bags full of fresh greens and freshly picked vegetables. One farmer even has every lettuce you could imagine for sale, and these amazing greens inspire me weekly to create what I now call my “Farmer’s Market Salad”. A salad does not have to be boring, although most folks think a salad is simply a handful of lettuce, perhaps a tomato, cucumber and maybe a chopped green onion or two. Once you start with some really great fresh crisp greens though you can add a myriad of other fruits and vegetables to create a unique and delicious salad no one could ever call boring. My salad changes weekly depending on what market vegetables catch my eye, but the salad in the photo includes a variety of greens, yellow cherry tomatoes, icicle radishes, roasted beets, blanched green beans, cucumbers, garbanzo beans, and chopped fresh fennel, all dressed with a zesty dijon herb vinaigrette (see dressing recipe below). You can choose your own salad favorites, but do try and think of vegetables you normally might not include in your salads. I call my Farmer’s Market Salad a “multivitamin in a bowl”, and if you enjoy one of these delicious salads a couple of times a week you really will not need to take additional multivitamins! * Begin your market salad with the freshest greens you can find. Choose lettuces with different textures, colors and flavors such as romaine, radicchio, frisée, mache (lamb’s lettuce), arugula, escarole to name just a few of my favorite varieties. * Think color and texture and add as much as both as you can to every salad you make to boost the nutritional value and flavor. 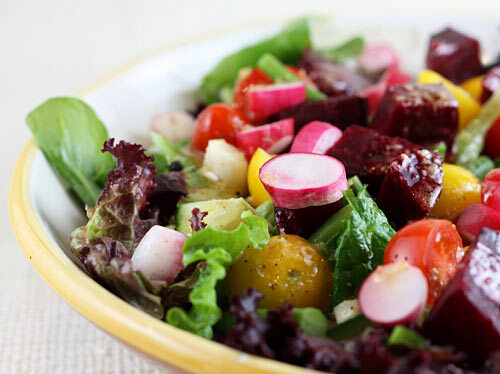 * Roasted vegetables such as beets, sweet peppers, or baby red potatoes are delicious sliced, or cubed onto salad greens. * Thinly sliced raw vegetables such as mushrooms, fennel, carrots, zucchini, celery and artichokes add a nice crunchy texture to salads. Think also fresh broccoli florets cut into small bite sized pieces. * Fresh herbs add a delicious earthiness to any salad and some of my favorites are tarragon, chives, sage, basil, mint, dill, and parsley. * The addition of beans can take a salad from side dish to main course, and canned beans work just fine when thoroughly rinsed. I like to add garbanzo, cannellini, or black beans to my salads. Adding beans to a salad can turn it from an appetizer to a main course! * Adding nuts gives a salad added texture and crunch, as well as a lot of health benefits. My favorites are walnuts, almonds, pine nuts or pecans. * Use your leftover stale wholegrain bread to make your own salad croutons. I slice Italian whole wheat country bread, cube it and toss it with some olive oil and dried herbs and bake the croutons in a 350 degree F. oven until crisp and golden brown. I rarely ever throw out any leftover bread by using it for breadcrumbs or salad croutons. * Seasonal fruit is always delicious on salads whether it be crisp apples and pears, or sweet, ripe strawberries, blueberries or citrus sections. If using fresh apples and pears you should toss them in a little lemon water to prevent any discoloration. * For special occasions or when entertaining you can dress a salad up by garnishing it with edible flowers. Some flowers I like to use are nasturtiums, pansies, or sage flowers. * Cheese is always a welcome addition to a salad whether it is a grated hard cheese such as Parmesan or Pecorino, or a soft crumbled blue cheese or goat cheese. If you are watching your fat intake just keep the cheese portions small. A little generally goes a long way and adds a lot of flavor. 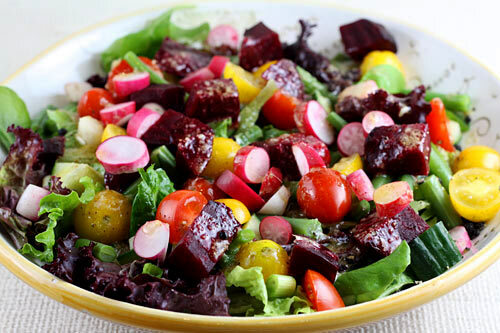 * Once you have chosen a selection of crisp greens, amazingly colorful vegetables, and a few choice toppings think carefully about what you want to dress your salad with. Stay away from thick, creamy, and heavy fat based dressings that will add a boatload of fat grams and calories to your salad and instead make a light homemade vinaigrette that will allow the natural flavor of your salad ingredients to sing! Choose olive oil as your dressing oil of choice as it is a heart healthy mono-unsaturated oil rich in antioxidant properties. Although I normally toss a simple green salad with a basic oil and red vinegar or lemon dressing, I feel my Market Salad requires something with a little more body and flavor so I top it with this tasty Herb Dijon Dressing which goes well with almost any vegetables. Whisk ingredients together until well blended and drizzle onto or toss with your salad.